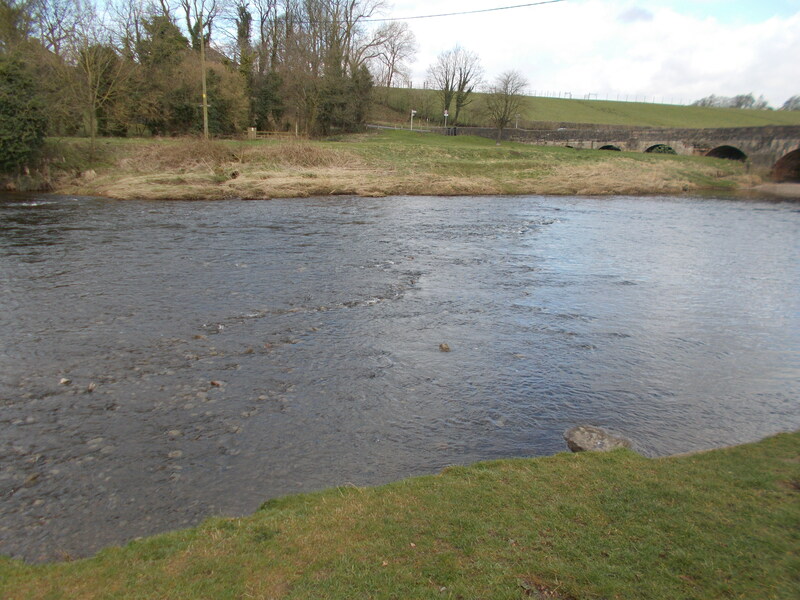 Before the first bridge was ever built at Edisford this was an important crossing point of the River Ribble. Anyone visiting today can see how shallow parts of the river are here, and that there is a natural ford. Rivers were often huge barriers in the landscape, and knowledge of the location of the relatively few fords and bridges was essential in medieval times. Foot and cart traffic could pass by fairly easily on the route out of Clitheroe to Lancaster via Edisford. Fords were also important strategic points and this could be the reason it was the site of a medieval battle, during the turbulent reign of King Stephen. Civil war gripped England in a period that has come to be known as ‘The Anarchy’. King Stephen’s forces fought a whole series of battles against those of his rival claimant to the English throne, Empress Matilda. The King of Scotland, David I, sided with his niece Matilda. He also sensed that he would be able to expand his own kingdom further into England. To this end he sent his nephew William fitz Duncan with an armed force down to raid the Furness and Craven regions. William came via the Trough of Bowland and on arriving at Edisford fought against an Anglo-Norman force. He beat them resoundingly on June 10th 1138, this event becoming known as ‘The Battle of Clitheroe’. The victorious Scots went on to join the rest of their massed ranks in Yorkshire, near Northallerton. Here they fought the Battle of the Standard at Cowton Moor- a much larger conflict, but this time they lost to Stephen’s troops. Records show that there was a medieval leper hospital at Edisford close to where the bridge is now, dedicated to St. Nicholas. It came into existence sometime in the late 1100s to early 1200s and was built on land given by Roger de Lacy. It was still in existence in 1317 as evidenced in a cartulary (a charter) owned by the Towneley family of Towneley Hall. By 1350 though, just a few years after the first bridge at Edisford was built, it was stated that there had been “no lepers at Edisford for some years past” and its assets had been transferred to Whalley Abbey. By the time of the dissolution of the monasteries its buildings were said to be “ruined and decayed”. Leper hospitals were monastic institutions and so had attached chapels that were important buildings in their own right. There is some evidence that the chapel here continued for perhaps another 200 years after the hospital was vacated. (For a good comparison, see our page about St Mary Magdalene’s leper hospital in Preston here.) Local historian and author Elizabeth Ashworth’s website has some discussion on a page about leprosy as to the whereabouts of the hospital (see her website page here). She believes it was located where the Edisford Bridge Inn hotel stands today. Two recent planning applications to Ribble Valley Borough Council discuss other possible sites- Edisford Hall Farmhouse and Roefield House. There is no evidence for the farmhouse being the location for the hospital (other than local tradition), but the Roefield House has a stronger case. The reasoning for this is that a 1700 map shows fields in its area called Chapel Ground and Far Chapel Ground, presumably named after the hospital’s attendant chapel. The original medieval bridge was built in 1339 after a ‘Grant of Pontage’ was issued. It was widened in the 1800s but still contains much of the original medieval elements. The historian Jessica Lofthouse states that the medieval mason marks can still be seen on the underside of it. Made from finely cut sandstone it has arches of varying sizes. Its historic importance means that it is now recognized as a Grade II listed monument. Soon after the bridge was built it was severely damaged in floods. To fund repairs a toll was set up. In her book The Bridges of Lancashire and Yorkshire, Margaret Slack gives the complete list of goods that carried a charge. Items crossing the river were individually priced, some high, some low depending on their rarity value. Pepper, wine, wax, honey and lead all carried a high tariff. Sheep and pigs were very cheap, literally as she notes “ten a penny”. Some indication of the industries that were being supplied can be seen in the charges for individual specialist items: for the woollen industry there were teasel flower heads (to knap wool), and woad (for dying it). Alum was also being transported and this can be used as a dye as well as for tanning leather. There was even a catch-all category for “anything for sale, not yet specified, exceeding the value of 5 shillings”. 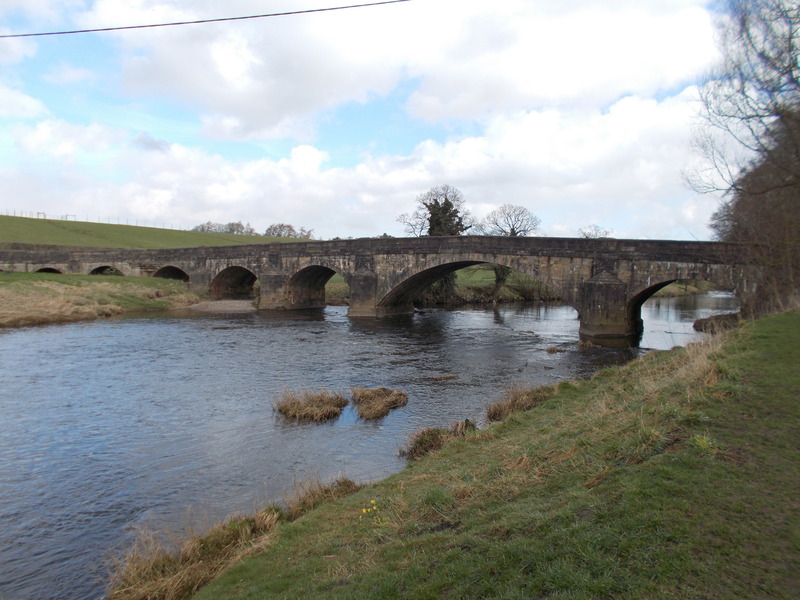 Until 1600s this was the only bridge crossing the River Ribble north of Preston. However, its importance didn’t stop the local authorities in Clitheroe from trying to wriggle out of their duty to maintain it. In 1657 they claimed that they had the right to be free of all dues and taxes levied on bridges, thinking that they should have no reason to pay towards its upkeep. Not only was this granted, but they also received a refund for money previously paid! Today Edisford Bridge is still part of a vital route in and out of Clitheroe as well as being a well loved local ‘beauty spot’. For generations it has been known to campers, walkers and picnickers alike. It’s well catered for with a large visitor car park on one side of the river and the Edisford Bridge Inn on the other side. Next time you pass over the Ribble here perhaps take a moment to think of all the many people that have done just the same, in the past thousand years of history. There is a very large pay and display car park by the bridge on the Clitheroe side. Then just follow the footpath down to the river for good views of the Ribble and Edisford Bridge. It is a popular picnic site and the pub, also called Edisord Bridge is on the other side of river. ‘Townships: Clitheroe’, in A History of the County of Lancaster: Volume 6, ed. William Farrer and J Brownbill (London, 1911), pp. 360-372. British History Online http://www.british-history.ac.uk/vch/lancs/vol6/pp360-372 [accessed 5 April 2018].